For the past five years much of my life has revolved around researching Brandon during WW1. This year sees the centenary of the Armistice, the end of fighting, in 1918, and will then signal me closing this chapter of my research. I is now time to pursue other research. 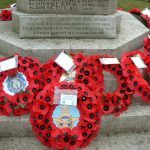 Therefore I am keen to see Brandon remembers the Armistice. With my involvement at Brandon Heritage Centre I can, to some extent, steer a part of that remembrance – although my angle is that it should not all be sombre reflection, but education with a twist of entertainment. So my research is going into another book, which I have applied for funding for the printing of, and received approval. This will mean the book will be offered to all Brandon residents free of charge. This will mean the people and their experiences from 100 years ago will be in the homes of many people today. Also in the planning stages are a 1918-era football match and myself giving a candlelit talk at the war memorial – I might even deliver it in a WW1 uniform for added theatre! Each year seems to get busier and busier!! 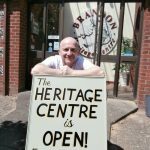 After months of being asked to get involved with Brandon Heritage Centre, I finally submitted to the pressure and offered to lead a community group in its running. The centre was already in decline when I raised funds for it through the sale of my ‘Brandon at War – memories of the Second World War’ book in 2015. Then the centre failed to open in 2016. There were discussions about closing the site permanently, disbanding the collection and even turning the building into two residential properties. The Brandon community was not impressed. A meeting of Trustees was called to discuss the centre’s future. Usually the meeting would be attended by the Trustees and at best one or two people from the community. On this occasion more than sixty members of the public were in attendance – all with one voice saying the centre must remain open. What followed was a whirlwind of activity – I was handed the keys to the centre, new Trustees were voted in and a new management committee was formed. It was a very busy time leading the management of the centre, creating its website and writing articles for local publications. We re-opened the centre on 1st July and closed 29th October – overall the centre saw the most visitors and donations in many years, even though we had only been open half a season! A single donation of 10,000, plus fund raising from the volunteers, saw enough money raised to enable us to modernise the centre’s flint knapping display. What a fantastic achievement. My research into WW1, led to the discovery of a riot in Brandon during 1919. This was such a fascinating story that it had to be shared, so I narrated it and the book ‘1919 – Brandon Riot’ went on sale. It tells the story of Brandon residents rioting in the town’s High Street at a perceived injustice metered out to a disabled war veteran. The war veteran, who had lost a leg in the war, was assaulted by a Brandon councillor and it was this that triggered an estimated 1,000 people (almost half the town’s population) onto the High Street in Brandon. The councillor’s home and business were attacked, with some of the mob wanting to do mortal harm to the man. The book tells the events that lead up to the riot, the riot itself and the aftermath – when it had to go to court to be sorted out. There is background information to the key individuals, so we may get an insight into their actions. Today, that Councillor is still very much revered among his peers, and few people have ever heard of the night Brandon rioted in 1919. All my books can be purchased via this website, just click on the ‘bookshop’ tab. Alternatively if you live in or near Brandon, then you can purchase a copy from Brandon Heritage Centre, George Street. The ‘1919 Brandon Riot’ book raised 500 for BLESMA – a charity that cared for the disabled war veteran who was assaulted, and still continues that care for modern day servicemen and women. This year saw my second book, ‘Brandon at War – memories of the Second World War’. The book featured excerpts from interviews I conducted with Brandon residents over the years, including their experiences during the Second World War. Reg Sylvester, then Chairman of Brandon Town Council, paid for the printing of the book from his Locality Budget. This then meant that all proceeds of the book’s sale went straight to Brandon Heritage Centre. At the time the centre was in dire need of funds. The book proved very popular and realised over 600. I am keen for future books to be self-funding and for the benefit of a charitable cause. I am passionate about sharing my research as far as I can. 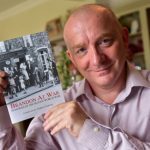 So in 2015 I updated my ‘Brandon at War’ website, splitting my WW1 and WW2 research into two separate websites and using a generic ‘Brandon at War’ headline page. This year also saw an increase in workload through doing talks. School visits are my favourite, and perhaps the best ones are those where a wartime meal is served and the stodgy pudding is always a favourite! School children always seem so responsive to learn about the past, so a couple of hours exploring Brandon life 100 years ago, always flies past. Toward the end of the year I identified some WW1 medals, listed on Ebay, as belonging to a Thetford man killed in that conflict. Fortunately, upon alerting his descendants, the medals were reunited with the rightful owners. This was probably one of the most fulfilling experiences through my ‘Brandon at War’ research. Read their story. 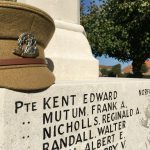 In 2012, aware that the centenary of the ‘Great War’ (WW1) was a little over a year away, I began researching the men who appear on Brandon’s war memorial. At the inception of the research I knew nothing – no battles, nothing about the men, nor anything of home life in Brandon. Through eighteen months of research I came to understand what it was like to life in the war, not just about the men who were killed. 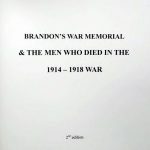 I began writing a monthly article for a local magazine, titled ‘Chronicles of Brandon at War’. The interest in the war was heightened when I printed my initial research and raised money for the Poppy Appeal, via Brandon British Legion. What began now was a much more detailed research into the lives of Brandon people living in the town during war and how the war affected residents – ‘Kitchener’s Army’, conscription, Volunteer Training Corps, the shortage of labour, the shortage of food, who was allowed to sell which foods, rationing, soldiers billeted in the town, who was doing what, people in court, etc. The list is endless. There were times the research felt like watching a movie as someone’s life unfurled before me. It was no I realised I was drawn to the social history of Brandon and so created the ‘Brandon, Suffolk – Down Memory Lane‘ Facebook page to share others’ experiences/research of Brandon days gone. In 2001 I began researching my hometown of Brandon, Suffolk, during the Second World War. I was hopeful the research would be a hobby to keep me occupied through the summer. Having had an interest in war since I was a small boy and combined with an interest in my hometown’s history, sparked by readying B.A.M. Lingwood’s ‘Brandon Notes’ in the 1980s, I embarked upon my research. Back then this involved me travelling to the Record Office at nearby Bury St. Edmunds, to uncover information. This was complemented with visits to speak with Brandon residents and learn from their experiences. Many of these ‘interviews’ gave me a real insight into Brandon’s past. Today I still interview residents, but information is now much easier to find because of the vast online resources. The internet also brings a two-way exchange of info through emails from relatives of people who feature in Brandon at War. I am very thankful to those correspondents for sharing their photos and family histories. Much of the 1914-18 research was found online, again complemented by many residents offering photographs of their ancestors. If you have anything you feel is relevant to ‘Brandon at War’ then please email me.